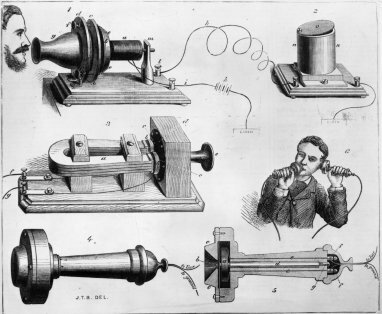 Alexander Graham Bell came from a family that had a passion for communications. His father, Alexander Melville Bell (1819-1905) developed Visible Speech (a way of translating human vocal sounds into different symbols) in 1864. The definitive work on Visible Speech was published in 1867. The house and grounds sold in August of 2018. Alexander Bell was born on March 3, 1847 in Edinburgh, Scotland. He was the second of three sons. His younger brother, Edward sadly died at the age of 19 from tuberculosis. Three years later, his older brother Melville tragically died from the same thing. 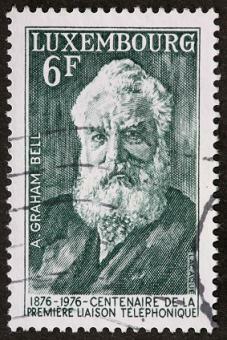 Alexander adopted the name "Graham" from an admired family friend in 1858 and was known as Alexander Graham Bell from then on. Bell went to live with his grandfather (also named Alexander - so confusing!) in London and the next year he began teaching music and elocution at the Weston House Academy in Elgin, Scotland. He also performed experiments with vowel pitches and tuning forks during his time there. Shortly thereafter, he returned to London and taught speech to the deaf at Susanna Hull's School for Deaf Children. After a brief move to Ontario, Canada, Bell soon relocated to Boston where he taught at the School for Deaf Mutes, the Clarke School for the Deaf and the American Asylum for the Deaf in Hartford, Connecticut before opening his School of Vocal Physiology in Boston in 1872. It was then that he started experimenting with the multiple telegraph. He also met his future wife, Mabel Hubbard, at Boston University. Are you still with me? This is where it gets exciting! In the spring of 1874, Alexander Graham Bell conducted various acoustics experiments at M.I.T. (the Massachusetts Institute of Technology). He and an ear specialist by the name of Clarence Blake experimented with the mechanics of the human ear and the phonautograph, a device that translated sound vibrations into visible tracings. 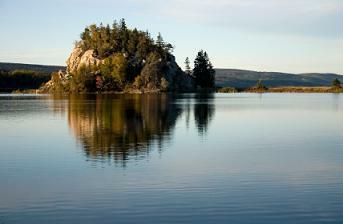 It was that summer, while in Ontario, Canada, that Bell first came up with the idea for the telephone. Upon returning to Boston, Bell met a young electrician named Thomas Watson, who became his assistant. 1875 was a banner year for Bell. He was able to secure the financial backing of investors, and in March of that year, Bell visited Joseph Henry, a prominent scientist at the Smithsonian Institution and explained to him his idea for the telephone. Henry offered his encouragement to Bell. In November, he and Mabel got engaged. Valentine's Day 1876 was the day Bell (now 29) filed a telephone patent application at the United States Patent Office. Just a few hours later, the attorney for Elisha Gray filed a caveat for a telephone. A month later, United States Patent No. 174,465 is officially issued. Three days later on March 10th, some intelligible human speech was heard over the telephone for the first time when Alexander Graham Bell uttered the famous words, "Mr. Watson! Come here, I want to see you" to his assistant. That summer, Bell demonstrated the telephone at the Centennial Exhibition in Philadelphia. A year later, on July 9, 1877 Bell, along with investors Gardiner Greene Hubbard, Thomas Sanders, and his assistant Thomas Watson form the Bell Telephone Company. Bell and his fiance Mabel are united in marriage that same week. They soon left for England where Bell was able to demonstrate the telephone for none other than Queen Victoria herself! Daughter Elsie May Bell was born in the spring of 1878. Bell spent some time in court due to patent litigation involving the Bell Telephone Company versus Western Union Telegraph Company and Elisha Gray. Luckily, a settlement was reached. The Bell Telephone Company ended up merging with the New England Telephone Company, and became known as the National Bell Telephone Company, then (in 1880) the American Bell Telephone Company. That's the same year Bell and Mabel had their second child, a daughter named Marian "Daisy" Bell, and Bell invented the photophone, a piece of equipment that transmits sound through light. Charles Sumner Tainter worked with Bell on that invention. The pair, along with Bell's cousin Chichester would later invent a wax cylinder for Thomas Edison's phonograph. 1881 saw some unfortunate events for Alexander Graham Bell, who is credited with the invention of the metal detector. His attempt to use this "induction balance" device to locate the bullet inside President Garfield after the shooting was unsuccessful. Bell also lost an infant son, named Edward. A little company you may have heard of was formed on March 3, 1885. The American Telephone & Telegraph Company (better known as AT&T!) began to manage the expanding long-distance business of the American Bell Telephone Company. Bell met a six-year-old Hellen Keller, blind and deaf in Washington, D.C. He helped her family find a private teacher. In October of 1892, Bell participated in the formal opening of long-distance telephone service between New York and Chicago. In 1901, Bell invented the tetrahedral kite, with a shape of four triangular sides which made it light, strong, and rigid. 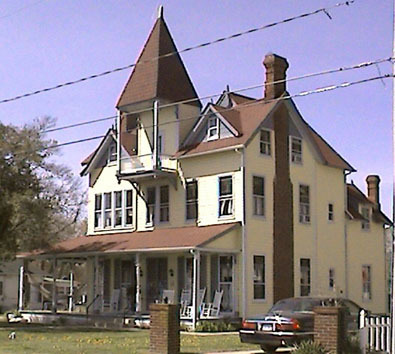 It was on the widow's walk of The Bell House (a famous B&B these days) that Bell and his friends stood and flew kites to test them. January of 1915 saw Bell taking part in the formal opening of the transcontinental telephone line. He spoke on the telephone in New York to Watson who was all the way in San Francisco. Alexander Graham Bell died on August 2nd, 1922. He was buried at Beinn Bhreagh, on Cape Breton Island in Nova Scotia.